Take a stop-over at Masindi hotel for lunch. We will continue through the park stopping at the top of the falls which is a fantastic sight. Here the Nile, the longest river in the world, is forced through a narrow gap in the rock (only 7 meters wide), before ferociously plunging down 43 meters. From here we will continue onto our accommodation place along the Nile river. Meals Included today: Lunch and Dinner at the Lodge. Afterwards, we drive to Queen Elizabeth National Park this morning (about 3 hours driving). Leaving through Fort Portal town, you turn south and early this afternoon enter Queen Elizabeth National Park, which is dominated on its northern border by the snow-capped 16,000-foot Rwenzori Mountains-the famed "Mountains of the Moon". This 767-square-mile conservation area is bordered on the North East by Lake George and on the South West by Lake Edward; its western border adjoins the Zaire Parc Du Virunga. You will expect to see teeming herds of impala-like Uganda Kob, as well as topi, elephant and lion, giant forest hog, Cape buffalo. There are also several soda lakes filling ancient volcanic calderas where flamingos reside seasonally. We set out early in the morning for a game drive in the northern part of the park on the Kasenyi Track in search of lions, elephants, solitary buffaloes. This is the best time for opportunities of viewing the cats in action owing to the vast population of Uganda Kobs. We have an excellent chance to view just about every animal here at very close range. In the afternoon we will go for a launch trip along the Kazinga Channel. This gives you the opportunity to view wildlife up close: hippo’s huff and spray very close from the boat, buffalo linger in the shallow; elephants watering, and many other wildlife. At least 80% of the wildlife in Queen Elizabeth national park can be found along this Channel. The shores of the channel are also home to an array of birds including pink backed pelicans, pied and malachite kingfishers, saddle billed stork and many others. We drive through the Ishasha sector in search for the tree-climbing lions. Nowhere in Africa do you stand a better chance of seeing this than in the large low limbed fig trees of Ishasha. This game drive en route will expose you to some of the animals that you might have missed seeing while on your game drives in Kasenyi and Queens Mile. 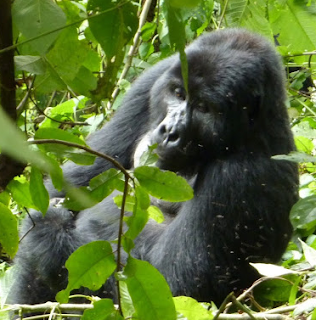 Afterwards, we head towards the breathtaking adventures of Bwindi Impenetrable Forest National Park. After breakfast, set out for a 5-hour canoe trek as well as bird watching on the beautiful Lake Bunyonyi, traversing to the gorgeous Kyabahinga peninsula. Here you will be gladly welcomed with songs plus dances by the resident school children. You will enjoy with the locals at least a cup of “Obushera” which is a local brew. You will ascend the Kyabahinga slopes having a wonderful opportunity to enjoy the birdlife and the verdant terrain. The view is very breathtaking! The guide will certainly brief you about the history of the area. Included : all tour activities as indicated above – 1 gorilla permits per person, chimpanzee tracking permits, 10 nights accommodation (with breakfast, lunch and dinner included), sightseeing as noted in the trip itinerary, park fees, entry fees, ground transportation, a carton of bottled mineral water.